I finished the book the week before last, but last week my house was in an uproar and just chaotic over the death of my best friend's mother, so I never got the chance to set down my thoughts about it. Life is starting to settle down again so here we go. A few years back, Tan Twan Eng's novel The Gift of Rain was longlisted for the Man Booker Prize and I remember thinking how very not cool it was that it didn't go on to make the shortlist. That was the year that Anne Enright won for her The Gathering, which I didn't really care for; it was also the year I was introduced to the work of Mohsin Hamid (The Reluctant Fundamentalist) and Lloyd Jones (Mister Pip), two authors whose novels I've really come to like. When I read The Gift of Rain that year, I definitely hoped it wouldn't be the last I saw of its author, so this year I was happily surprised to see his newest on both the Booker longlist and then the shortlist. Frankly, I would have bought it anyway even if it had not made it as a judges' selection. When she relays her fears to a long-time friend, he convinces her that she should write down everything, and so she begins to record all of her memories. Her story begins in her twenties, when she makes her way to Aritomo, who lives next to the tea plantation owned by friends of Yun Ling's family. She has come to ask Aritomo to fulfill her now-dead sister's dream and create a garden dedicated to her memory, but Aritomo refuses. Instead, he makes Yun Ling an unprecedented offer: he will take her on as apprentice until the return of the monsoon. Despite her ongoing, intense hatred for the Japanese, the beauty of Aritomo's work at Yugiri leads her to accepts his offer. While she works with Aritomo, they slowly begin to discover that despite their differences, they have a great deal in common other than gardens. Her account of the past winds its way through the Japanese occupation of Malaya which led to Yun Ling's imprisonment in a Japanese prison camp, the sister she left behind, the ongoing hope of nationalists for the country's independence from the British, and the communists who are attacking plantation owners during the Malayan Emergency. It all adds up to an unforgettable story of two very different people who have carried their ghosts around with them for years -- and what they discover about themselves and each other in the Garden of Evening Mists. It is also a story about memory and forgetting, loss, guilt and survival. 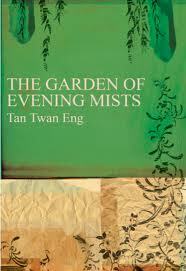 There is so much to love about this book, especially in Tan Twan Eng's descriptions. As Yun Ling explores the garden, she discovers Aritomo's focus on the ancient art of "Shakkei," or "borrowed scenery," and the reader is right there along with her. Through the author's descriptions, the reader, like Yun Ling and other visitors to Yugiri, is invited to stop at different points of the garden to appreciate the perfect framing of the sea or the turning of a waterwheel, or even to ponder the distance between stones. 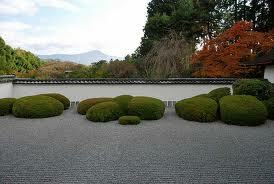 Kyoto garden which "borrows" Mt. Hiei in the background. But it's not just in Aritomo's garden where the richness of place comes alive -- the jungles, the tea plantations, the beautiful homes with their wide verandahs, the villages, even the prison camp hidden somewhere in the mountains -- the author makes them all real so that at times it's easy to imagine hearing the sound of birds or to feel the lush grass beneath your feet. The characters are also carefully constructed. The pasts surrounding Yun Ling and Aritomo are uncovered little by little, creating an aura of mystery around their characters. But there is also something to love about what is not in this story: there is never any sort of apology from Aritomo to Yun Ling regarding the abuses she and her sister suffered at the hands of the Japanese; and it is clear from the outset that there has never been any kind of forgiveness from Yun Ling. There is also no perfection in the characters; instead they are shown to be human with their flaws and vulnerabilities, even as the reader follows them throughout their individual transformations. There are many reviews of this novel that point to a number of formulaic similarities between this book and The Gift of Rain -- and there might be a little something to this idea, and there are places where the book gets fluffy in terms of writing style, but in the end it just doesn't matter. I'll leave the critiques of mechanics, style, and other elements to the experts, but from a casual reader's perspective, Garden of Evening Mists is an elegant book with an incredible woman at its center. It is certainly the most emotionally powerful of the books (read so far) on this year's Booker Prize shortlist, but whether it wins or not, it is definitely one not to miss.